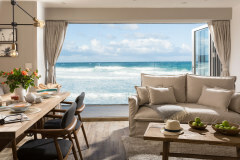 Created perfectly for two, Lowen combines relaxed coastal chic with a luxury ambiance for your time out in North Cornwall. 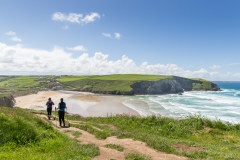 Swap your urban heels for beach side sandals and explore this very unique peninsula flanked with the most beautiful golden sand beaches and some of Cornwall’s most breathtaking seascapes. Lowen is a split level abode offering ever changing views of the River Gannel and beyond to Crantock Beach. 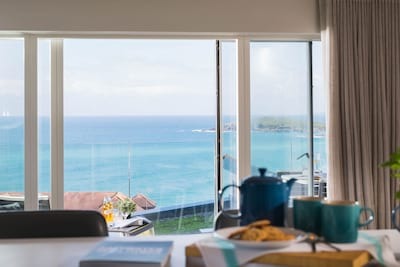 Lowen is set within the newly converted wooden clad Pavilions within Pentire Headland, stylishly created to evoke the sports pavilions of yesteryear, the thoughtful design creates an idyllic backdrop to your holiday. Reverse level in layout; arrive to the spacious landing of the first floor leading to the master bedroom and large bathroom. From the moment you arrive the attention to detail, cool colour palette and superior furnishings sets the luxury scene. 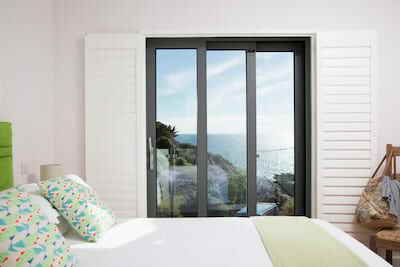 The master bedroom overlooks the River Gannel, breakfast in bed is encouraged as you take in the coastal vistas, awake re-energised and retire to this welcome indulgent haven. Located next to the bedroom is a smart contemporary bathroom complete with deep bath and power shower. The staircase leads down to the open plan generous living space and kitchen with double doors leading onto the patio and garden. This sunny room is flooded with natural light and creates a versatile space in all seasons from cosy winter nights to lazy summer afternoons. The enviable kitchen is super-stylish with smart clean lines and soft close cabinets cleverly masking ample storage, fully fitted and well equipped, enjoy some Cornish home cooking during your stay. A country style dining table and chairs is the hub to the house as you map out the day's plans or enjoy dinner-for-two. Ample relaxed seating and all mod cons complete the luxury ambiance within the living room. From the double doors of the living room step out onto your paved terrace and grassed lawn with all-weather dining table and chairs. 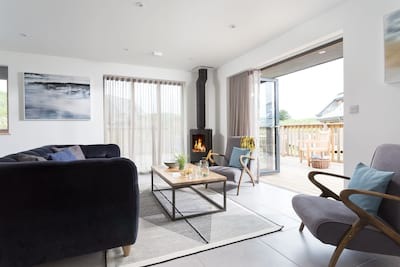 Lowen is set within the exclusive grounds of Corisande Manor, the communal grounds are well tended and brim with colour from the lavender beds to the wild flowers. Railway sleeper steps lead down to the terraced garden, along the path and down to the river bank. 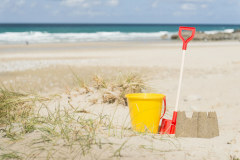 At low tide simply walk onto the beach and across to Crantock or at high tide take the small ferry across. Leaving the car behind, explore on foot and head up to the Pentire Headland for the best sunset spot on the coast. The Lewinnick Lodge is a short walk away and well worth a reservation or stop at the Fern Pit Café for afternoon cake and tea. For a local treat, handpick your lobster from the Fern Pit pots and let them prepare it ready for your supper – coastal perfection. 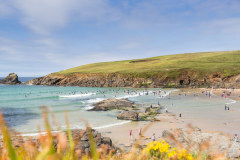 The energy of Fistral Beach is moments away, take to the water yourself with a lesson or two or admire the pro’s from the comfort of the golden sandy beach. A private lockable surf store is available, perfect for all your holiday beach kit and for drying wetsuits. 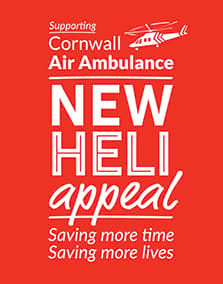 Whether you are new to this corner of Cornwall or it’s a favourite childhood haunt then reacquaint yourself with Pentire Headland and relax in the comfort of Lowen. We had an amazing week here, and the view is spectacular. We're missing it already! 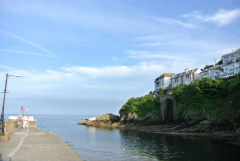 Lovely property with fantastic views of river and coast. Cottage had everything you needed. 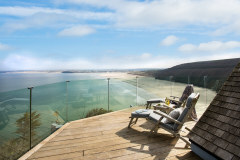 We were so impressed with this property and the view and hope to return. As we booked this property for the week after our wedding, the champagne was an extra special touch. Thank you. We really loved the property and location. The property was stunning and in a stunning location, we were extremely impressed. We were also very impressed with Cornish Gems. It was great to have everything we needed without the pressure of having to be at the property for a set time to meet someone. We hope to book this property again, because we loved it. Absolutely beautiful accommodation in the most perfect location. Couldn't have wished for a better place to stay. Still dreaming about it! Lovely property fantastic views definitely recommend property to family and friends. This was a stunning property - tranquil and beautiful and so was perfect for our first holiday with our new baby. Thank you for a really special time. 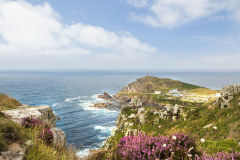 This is only my 2nd booking with Cornish Gems - after years of using other companies. It is a far superior service and the properties are much nicer. Will be booking again, thank you. An excellent break was had. This is our first visit to Cornwall for many years so looked for somewhere special to stay and certainly found it at Lowen. Top class property and service. The house was beautiful, would love to return. 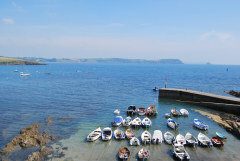 We had a fabulous holiday and have already recommended the property and Cornish Gems to my friends and family. The location was amazing and so quiet and relaxing. The apartment is in a beautiful spot and the surrounding area very absorbing with a relaxing atmosphere to enjoy. The team was always charming and very helpful on the phone. The cleaners were excellent. The welcome bag of goodies was appreciated. The property was superb and we will definitely book again. The view was so spectacular that we were very happy to spend our time overlooking the Gannet and the Atlantic and not explore Cornwall further.